If you are either parent or a guardian, you probably know that what you tell your children is what they become. If you motivate them every day and give them a reason to go out there and work for their future, they will grow up to become determined young adults who will know how to put their priorities right. If you pull down their self-esteem and intimidate them, they will go out there ready to be defeated by the world and cower away in fear. In this light, one woman named Stacey Truman has chosen to go with the former. Stacey is a mother at home as well as a worker in the Kingston Elementary School cafeteria, Virginia. She has worked there for nine years now and has had the chance to see little darlings grow up to become teenagers and make their way out to face the world. Stacey picked up a habit some time ago that she has been putting to work with her won children, and she thought it would be a good idea to bring it to work with her. Every time she packed her children’s lunches, she put in a word to motivate them and help them look at things differently. The woman knew that it would change the way they thought and make things a whole lot easier for them. 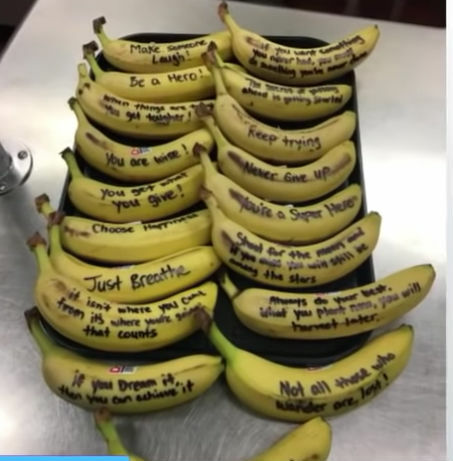 She, therefore, started writing inspirational messages on their bananas so that they would have some motivation to go by as they took their lunches. 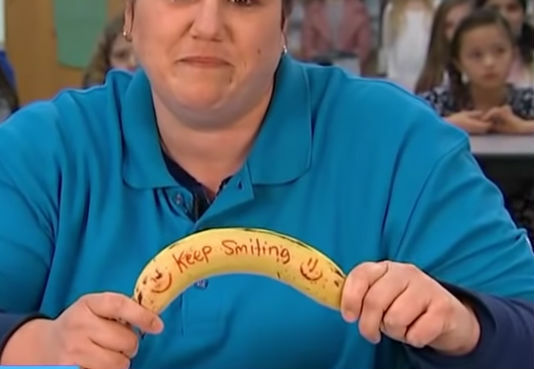 One day, she brought her permanent marker to school and started scribbling those little messages on the children’s bananas. It was not very long before the school administration, and the parents learned about Stacey’s act. The principal paid a surprise visit to the cafeteria one day and grabbed a banana. It had the words “Be your best self. ” on it, and without much thought, she took a photo and shared it along with the whole story on Twitter. It went viral in a heartbeat with mothers all over the country commending Stacey for her advice. The children were also thrilled. They could not wait for lunchtime so that they could rush to the cafeteria and grab their talking bananas. Stacey is still reaching out to the kids with the positive messages which she hopes will inspire them to do great things as well as live their life without negativity. The words that children come across as they grow play a significant role in defining who they become when they grow into adulthood. They need someone to tell them that the world could be a better place if they made it. They need to learn the value of determination even in the face of what looks like certain failure. Children need to know how to set their priorities in life, and that there are good people out there. Keep your child away from negativity and life critics. Speak life to them.